Edo period Japanese were fond of visiting Ise Shrine, other shrines and temples, and also famous mountains, none more so than Mount Fuji. However the purpose of visiting Mount Fuji was not to enjoy the view from the top, which as the saying goes is preferred only by stupid bigheads and smoke (baka ya kemuri ha takai tokoro ga suki). So instead of climbing the mountain, they more often chose to climb a model of the mountain, wearing full pilgrim's attire, at one of the shrines at the base of Mount Fuji (Ohwada, 2009, p. 40: quote in Japanese below). There is no size information in the visual. A bonsai tree looks the same as a massive oak, and a model of Mount Fuji can look the same as the real thing. If you wear the right kit and walk up a model, then you might as well have walked up the actual mountain, because they will look the same way. In he land of the sun-goddess the authenti-copies or simulacra (Baudrillard, 1995) are not words, which Westerners feel to be perfectly copyable because we have a listening comforter, but visual replications such as of mountains in front of Shinto shrines. Japanese culture is rife with authenticopies such as bonsai, model food in place of menus, dolls, horse and cow sculptures at shrines, masks, pictures of the deceased and his royal highness the emperor, and the god-head (goshintai) of the deities themselves that can be copied or split 'as one can split a fire' (Norinaga, see Herbert, 2010, p.99). The practice of visiting copies continues to this day in the form of creating foreign villages ("gaikoku mura") which fascinate foreign anthropologists and tourism theorists (Graburn, Ertl, & Tierney, 2010; J. Hendry, 2000; Joy Hendry, 2012; Nenzi, 2008). I don't think that they have noticed that the Japanese world is inside out yet, however. If it were indeed the case, as argued here, that the Japanese world is that of light, an amalgam of images, seen and 'insured' by the watchful eye of the Sun goddess, then in order for someone to pass from Western to Japanese culture, from a Western to Japanese world, they would need to pass through the veil of perception. Perhaps all one really needs to do is find the dead girl that you are talking off to. Perhaps that is what David Lynch (1992) meant by "Walk fire with me". 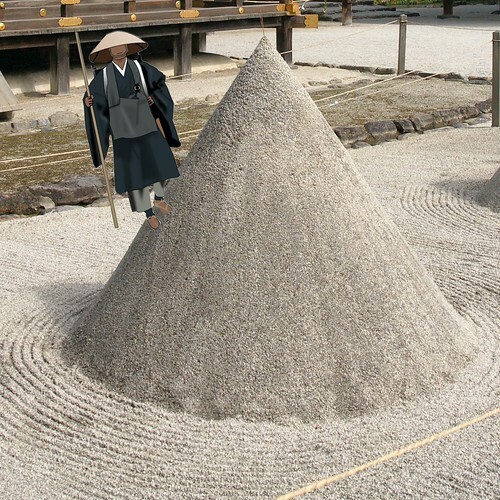 The above image is composed of a detail from the model mountains (though not of Mount Fuji) or standing sand (tatesuna) in Kamowake-Kazushi Shrine precinct by 663highland, and image of a monk in a straw hat from gatag copyright free image source. Graburn, N., Ertl, J., & Tierney, R. K. (2010). Multiculturalism in the New Japan: Crossing the Boundaries Within. Berghahn Books. Hendry, J. (2012). Understanding Japanese Society (4th ed.). Routledge. Herbert, J. (2010). Shinto: At the Fountainhead of Japan. Taylor & Francis. Lynch, D. (1992). Twin Peaks: Fire Walk with Me. Nenzi, L. N. D. (2008). Excursions in identity: travel and the intersection of place, gender, and status in Edo Japan. University of Hawaii Press. 大和田守. (2009). こんなに面白い江戸の旅. (歴史の謎を探る会, Ed.). 東京: 河出書房新社.